اولیازاده, مریم, رئیسی, زهره. (1396). اثربخشی آموزش راه‌حل محور بر تعارضات زناشویی و کیفیت زندگی در زوجین شهر اصفهان. سلامت جامعه, 11(شماره 3 و 4), 1-10. doi: 10.22123/chj.2018.85341. مریم اولیازاده; زهره رئیسی. "اثربخشی آموزش راه‌حل محور بر تعارضات زناشویی و کیفیت زندگی در زوجین شهر اصفهان". سلامت جامعه, 11, شماره 3 و 4, 1396, 1-10. doi: 10.22123/chj.2018.85341. اولیازاده, مریم, رئیسی, زهره. (1396). 'اثربخشی آموزش راه‌حل محور بر تعارضات زناشویی و کیفیت زندگی در زوجین شهر اصفهان', سلامت جامعه, 11(شماره 3 و 4), pp. 1-10. doi: 10.22123/chj.2018.85341. اولیازاده, مریم, رئیسی, زهره. اثربخشی آموزش راه‌حل محور بر تعارضات زناشویی و کیفیت زندگی در زوجین شهر اصفهان. سلامت جامعه, 1396; 11(شماره 3 و 4): 1-10. doi: 10.22123/chj.2018.85341. 1کارشناسی ارشد، گروه روان شناسی بالینی، دانشگاه آزاد اسلامی، واحد نجف آباد، نجف آباد، ایران. 2استادیار، گروه روانشناسی بالینی، دانشگاه آزاد اسلامی، واحد نجف آباد، نجف آباد، ایران. 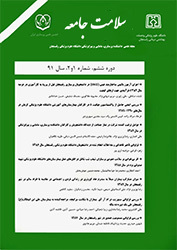 مقدمه: در سال­های اخیر، توجه به کیان خانواده و عوامل مؤثر بر آن، موضوع پژوهش­های متنوعی بوده است. بنابراین هدف پژوهش حاضر تعیین اثربخشی آموزش راه­حل محور بر تعارضات زناشویی و کیفیت زندگی در زوجین شهر اصفهان بود. مواد و روش ­ها: روش پژوهش نیمه تجربی با طرح پیش‌آزمون- پس‌آزمون با گروه کنترل بود. جامعه‌ی آماری پژوهش را کلیه زوجین مراجعه‌کننده به مرکز مداخله در بحران و کاهش طلاق بهزیستی شهر اصفهان در سال 1394 تشکیل دادند. 20 زوج به شیوه نمونه­گیری در دسترس انتخاب و به صورت تصادفی در گروه­های آزمایش و کنترل گمارده شدند. ابزارهای پژوهش شامل پرسشنامه تعارضات زناشویی Sanaei وBarati (1390) و کیفیت زندگی زناشویی سازمان بهداشت جهانی (1996) بود. برای گروه آزمایش، 7 جلسه 90 دقیقه­ای هفته­ای یک جلسه، آموزش راه­حل محور اجرا شد و گروه کنترل هیچ مداخله­ای دریافت نکرد. بعد از اجرای مداخله آموزشی، داده­ها جمع­آوری و از طریق روش تحلیل کواریانس مورد تجزیه و تحلیل قرار گرفت. یافته ­ها: میانگین و انحراف معیار گروه آزمایش در مؤلفه تعارضات زناشویی در پیش­آزمون (08/6 ± 00/150) و در پس­آزمون (20/5 ± 80/107)، در مؤلفه کیفیت زندگی در پیش­آزمون (06/5 ± 40/60) و در پس­آزمون (68/ 3± 75/77) بود. میانگین و انحراف معیار گروه کنترل در مؤلفه تعارضات زناشویی در پیش­آزمون (30/6 ± 00/149) و در پس­آزمون (93/5 ± 80/150)، در مؤلفه کیفیت زندگی در پیش­آزمون (48/5 ± 10/62) و در پس­آزمون (08/6 ± 95/61) بود. میانگین مؤلفه­های تعارضات زناشویی و کیفیت زندگی پس از ارائه مداخله آموزشی بین دو گروه آزمایش و کنترل دارای تفاوت معنی­داری بود (001/0>p). نتیجه­ گیری: بنابر نتایج پژوهش حاضر و پیشینه پژوهشی، می­توان روش راه­حل محور را به عنوان روشی کارآمد در کاهش تعارضات زناشویی و افزایش کیفیت زندگی زوجین دارای مشکلات ارتباطی و زناشویی پیشنهاد نمود. 1MSc, Dept of clinical psychology, Najaf Abad Branch, Islamic Azad University, Najaf Abad, Iran. 2Assistant prof, Dept of clinical psychology, Najaf Abad Branch, Islamic Azad University, Najaf Abad, Iran. Introduction: In the recent years, family-based subjects have attracted considerable attention from pertinent investigators. Therefore, the objective of the present study was to determine the effectiveness of solution-oriented teaching on marital conflicts and life quality in couples in Isfahan. Materials and Methods: The research design in this semi-experimental study was pre- and post-test with control group. The statistical population included all couples referring to the Family Interventions Center to Reduce Divorce of the Isfahan Welfare Organization in 2015. Twenty couples were then selected through convenient method and randomly into two groups of 10, experimental and control group. The data gathering instrument were Sanaie and Barati’s marital conflicts questionnaire (2011) and WHO’s marital life quality (1996). The experimental group received solution-oriented teaching for 7 weekly sessions of 90 min of and the control group received nothing. The data were then collected and analyzed through covariance analysis. Results: The analysis of the pre- and post- test data in the experimental group revealed that the means of component of marital conflicts were (150 ± 6.08) and (107.8± 5.20) respectively and of life quality were (60.40 ± 5.06) and (77.75 ±3.68) respectively. For control group, these values for marital conflicts were (149± 6.30) and (150 ± 5.93) respectively and for life quality were (62.10 + 5.48) and (61.95 ± 6.08) respectively. From the one hand the results showed that there is a significant in the components of marital conflicts and life quality after teaching intervention between the experimental and control groups (p<0.001). Significant differences were observed between the values of marital conflicts and life quality in the two groups (p<0.001). Conclusion: According to the results of the present study, solution-oriented method can be proposed as an efficient method to relieve marital conflicts and as a result to promote life quality. Bayerman S, Kleverson E. Family therapy and Self Differentation in women with and without mental disorders .PSBS 2014; 2(11): 223-32. Olson D. FACES IV and the circumplex model: Validation study. JMFT 2011;37(1):64-80. Keem D. The couples psychotherapy treatment planner. 2nd ed. New York: Guilford press; 2005: 74-5. Weat J, Galager AT. Cognitive therapy in clinical practice. 1nd ed.New York: Routledge; 2000:124-6. Onsy E, Amer MM. Attitudes toward seeking couples counseling among Egyptian couples: Towards a deeper understanding of common marital conflicts and marital satisfaction. PSBS 2014;140:470-5. Roy F, Baumeister KD. Handbook of self- regulation: Research, theory and application. 2 nd ed. New York: Guilford press; 2004:1-10. Corcoran J. A comparison group study of solution-focused therapy versus “treatment-as-usual” for behavior problems in children. JSSR 2006;33(1):69-81. Kvarme LG, Helseth S, Sørum R, Luth-Hansen V, Haugland S, Natvig GK. The effect of a solution-focused approach to improve self-efficacy in socially withdrawn school children: A non-randomized controlled trial. IJNS 2010;47(11):1389-96. Daki J, Savage RS. Solution-focused brief therapy: Impacts on academic and emotional difficulties. JER 2010;103(5):309-26. Morrison DR, Cherlin AJ. The divorce process and young children's well-being: A prospective analysis. JMF 1995;57(3):800-12. Gutta RE. (dissertation). An investigation into the significance of an acceptance based marital enrichment group on couple intimacy and acceptance. New Orleans: Baptist theological seminary; 2000: 41-4. Halford WK. Brief couple therapy.1 nd ed. New York: Guilford press; 2001: 97-100. Stanley SM, Markman HJ. Assessing commitment in personal relationships. JMF1992 ;54(3):595-608. Baucom DH, Epstein N, Sayers SL, Sher TG. The role of cognitions in marital relationships: Definitional, methodological, and conceptual issues. JCCP psychology 1989;57(1):31-42. Wilson KL, Charker J, Lizzio A, Halford K, Kimlin S. Assessing how much couples work at their relationship: the behavioral self-regulation for effective relationships scale. JFP 2005;19(3):385-93. Adıgüzel İB, Göktürk M. Using the solution focused approach in school counselling. PSBS;106:3278-84. Zimmerman TS, Prest LA, Wetzel BE. Solution-focused couples therapy groups: An empirical study. JFT 1997;19(2):125-44. Wettersten KB, Lichtenberg JW, Mallinckrodt B. Associations between working alliance and outcome in solution-focused brief therapy and brief interpersonal therapy. Psychotherapy Research 2005;15(1-2):35-43. Neilson-Clayton H, Brownlee K. Solution-focused brief therapy with cancer patients and their families. JPO 2002;20(1):1-13. Kim H. Client growth and alliance development in solution-focused brief family therapy. 2nd ed. The State University of New York: Buffalo; 2006: 54-8. McKeel A. Solution focused therapy: A selected review of research of solutionfocused brief therapy. J Psychol 2004;12:463-9. Seedall RB. Enhancing change process in solution-focused brief therapy by utilizing couple enactments. AJFT 2009;37(2):99-113. Koob JJ, Love SM. The implementation of solution-focused therapy to increase foster care placement stability. CYSR 2010;32(10):1346-50.